Why can't I accept my own answers right away? Which answer should I accept? For more information, see "What should I do when someone answers my question?" in the Help Center. Accepting Answers: How does it work? Accepting an answer is important as it both rewards posters for solving your problem and informs others that your issue is resolved. You may select any answer on questions you asked as the "accepted" answer. Only one answer at a time can be the 'accepted' answer. There's a brief period (15 minutes) immediately after asking the question when you can't accept an answer. someone else's answer: You get +2 rep and the author of the accepted answer gets +15 rep. Both of these reputation gains are exempt from the daily reputation cap of 200.
your own answer: There is no reputation awarded and the answer does not float to the top of the list. This can be done no earlier than 48 hours after the question is asked. Which answer should I choose? Don't hesitate to accept an answer that is well-written, suggests a good practice and works for you. Otherwise, even if there are answers that are good enough but that you're not entirely satisfied by, you might wait 24 to 48 hours to give other people a chance to give you a better answer. A question with an accepted answer isn't as likely to receive further attention as one without an accepted answer. Make sure that besides working for you, the answer is really good practice. Sometimes after the answer gets accepted, another comes in, uncovering the fact that previous one was in fact a bad hack. The bottom line is that you should accept the answer that you found to be the most helpful to you, personally. If an answer has helped you solve your problem and you accept it you should also consider voting it up. If other answers have been helpful too, you can also vote them up. You can upvote if you have gained the Vote Up privilege, awarded at 15 reputation. What should I do if none of the answers are suitable? Re-read your question critically and make certain that it's clear what the problem is, and what the specific question is. You might want to place a bold single sentence version of your question at the bottom of your post to make sure it's clear what's being asked. Re-read the answers. Consider accepting the best answer of the bunch, even if none of them are exactly what's needed. Wait a few days after asking it, and then edit your question with what you've learned since asking it — perhaps additional information will help others help you. This will also have the effect of bringing your question back onto the homepage where fresh eyes can see it. If you have more than 75 reputation, you can add a bounty two days after the question is asked if you haven't accepted any answers yet. This will place your question in the 'Featured Questions' list, and it will be more visible. A bounty will also add incentive for people to answer your question. Eventually you'll resolve the problem or find a work-around (which may be, "This won't work, so here's what I did instead"). Please add an answer with this information and accept your own answer so that others with your same question can see the path you eventually followed. If the question author started the bounty, and accepted an answer posted during the bounty period (not before), that answer will be automatically awarded the full bounty at the end (provided the answer is still accepted). If another user started the bounty, the answer to automatically award the bounty will still be selected in the usual manner (posted during the bounty period, highest-scoring answer with a minimum of 2, oldest answer in case of ties), but if the selected answer happens to have been accepted by the author, it will be awarded the full bounty instead of half. Not the answer you're looking for? Browse other questions tagged support faq answers accepted-answer self-answer . 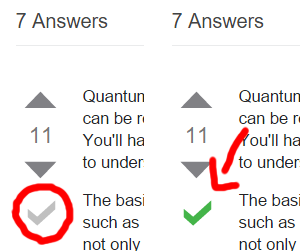 How mark my question as answered on Stack Overflow? How do I accept an answer — where do I click? How do I accept an answer to my questions? Just bouncing an idea - A way for the asker to let user's know “I am satisfied, you can go”? What answer should I choose as the correct answer for my question? May I, and how do I, change my mind about an accepted answer?